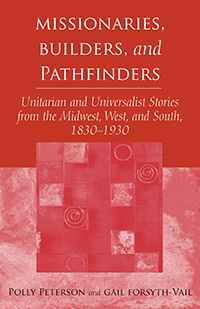 Here are twenty compelling stories of nineteenth- and early twentieth-century Unitarians and Universalists who carried their faith throughout the Midwest, West Coast, and Southern United States. These tell-able tales represent a slice of each person’s life and invite listeners to find wisdom for our own time in the insights and oversights, successes and challenges of these religious forebears. Each story is preceded by introductory material and followed by quotations that elaborate on the life and work of the subject. Supplementary materials make each story part of a complete program, including discussion questions suitable for small groups, activities for congregations and families, and suggestions for ways to apply the lessons from these lives to issues and challenges in today’s world. Ideal for adult religious education, congregational worship, small group ministry, Coming of Age groups, multigenerational gatherings, or family use. This is a companion volume to Stirring the Nation’s Heart: Eighteen Stories of Prophetic Unitarians and Universalists of the Nineteenth Century by Polly Peterson. The year 1856 was particularly violent. The town of Lawrence was sacked in May, its houses burned and its one hotel destroyed by cannon. Three ruffians sacked [Ephraim] Nute's house, breaking nearly everything and stealing his gun, some clothing, and his horse and saddle. That same month, Senator Charles Sumner, an abolitionist from Massachusetts, suffered a near-fatal beating on the floor of the Senate by a Congressman from South Carolina, and abolitionist John Brown murdered five proslavery settlers in Kansas in retaliation for the sacking of Lawrence. In August, the sister of Nute's wife came for a visit, and her husband, a man not connected in any way to the Free-State debate, was brutally murdered and scalped by a proslavery ruffian. As Nute was conveying his grieving sister-in-law to safety, he himself was captured by proslavers and imprisoned in a foul dungeon for many days. He barely escaped with his life. Discussion: Have you ever excused your own behavior because someone else's behavior was as bad or worse? What might happen if instead we focused in every interaction on "doing unto others as you would have them do unto you"? Would living by this Golden Rule strengthen your position because you stand on moral high ground? Or would it only invite the contempt of those to whom failure to retaliate indicates weakness or lack of resolve? Explore your roots. Where were your ancestors in the 1850s? If any were in the United States, were they personally either slaveholders or enslaved people? If they were not directly involved in slavery, do you know what position they took on the issue of slavery and its expansion into the western territories? Did any of them fight in the Civil War? If your ancestors were not in the United States, where were they? Were wars or revolutions occurring where they lived? What side did your ancestors take? Discuss how the circumstances and beliefs of your ancestors might have helped to form the opinions you now hold about which side was right or wrong in the conflicts of the past. How might the life stories of your forebears still be affecting you and your family today?